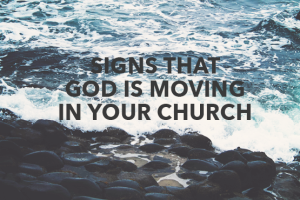 When God moves in a church, there are outward signs of what is occurring in the hearts and lives of those we’re pouring into. And one of the most obvious, is tearful responses to the truth that is given in it’s many forms. Have the kleenex handy! When God is moving, or about to move in a church, He breaks the ground with new spiritual talent. God understands His church needs leaders and workers to hold the Kingdom harvest that He is about to unleash. So watch and listen closely for others God is “planting” among you, even if they sound or look different than what you wanted or expected. The fire and passion that accompanies a “God Vision” brings the sacrifice of time to the equation. There’s generally not the option (nor should it be) to pay and staff all the work that needs to be done in a growing church. Enthusiaism creates buy in to the point others are willing to serve and give of their time sacrificially because they see the manifestation of their labor not just the desired outcome.